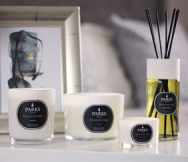 The Moods By Parks’ range of candles was created to help our customers choose from a group of products that directly support the kind of moods they wish to feel or support within their home or place of work. Each candle supplies a different handcrafted scent combination that can only be produced by people who truly love their craft. Coral flower is a lesser known scent, but one that deserves more attention! It is actually a type of procumbent rose of the species Heuchera micrantha, which is named after the delicate pink of its flowers. From an aromatherapy point of view, Coral flower is a gentle stimulant and general tonic. As a scent, it has notes that are reminiscent of bergamot, orchid and frangipani, and yet it has also been described as musky with a touch of amber. It should never be dismissed as merely ‘a type of rose’. The scent of this lovely candle takes from all of those ingredients and delivers a gentle, almost creamily textured perfume that can quickly penetrate an entire home without being overpowering or blunt. As a part of our Moods By Parks range, these Turquoise Coral Flower Candles are hand poured into a glass vase around three 100% natural soot-free wicks. Our unwavering commitment to quality means that we use only pure and natural smoke-free waxes and the finest aromatherapy grade essential oils. This three-wick candle will typically burn for 60 hours of continuous use, but can last for years if used sparingly.